Earth arms marines with alien technology and builds its first battle fleet! Kyle Riggs is snatched by an alien spacecraft sometime after midnight. The ship is testing everyone it catches and murdering the weak. The good news is that Kyle keeps passing tests and staying alive. The bad news is the aliens who sent this ship are the nicest ones out there…. 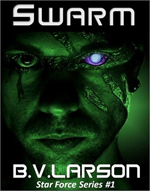 A novel of military science fiction by bestselling author B. V. Larson, Swarm is the story of Earth’s annexation by an alien empire. Long considered a primitive people on a backwater planet, humanity finds itself in the middle of a war, and faced with extinction. One of the fundamental challenges of writing fiction is the need to make characters and events believable without making them boring, or retreading the same ground as a dozen authors before you. This is especially difficult in genre fiction, such as military sci-fi, where so many wildly imaginative authors have already gone before. Fortunately, B. V. Larson walks the line between realism and action with near perfect balance. Swarm, the first book in his Star Force series, contains little in the way of truly original science fiction material, but the author assembles these familiar pieces into a fantastic roller coaster of a tale. Our protagonist is Kyle Riggs, who proves to be one of the most resourceful computer science professors in history. When alien machines invade earth he goes from being a mild-mannered single father, eating popcorn and watching movies with his kids, to a hard-hearted military commander in the course of about two weeks. By the end of the novel he is commanding full battalions of augmented marines, guiding the development of devastating weapons, and fighting toe to toe with robots the size of skyscrapers. It is a testament to the author’s skill at narration that all of these remarkable events happening to a single character only seems odd in retrospect. As the tale unfolds, each of Kyle’s actions and decisions makes sense in the moment, if not in the big picture, painting him as an everyman who is continually pulled into extraordinary circumstances. The only real problem with Swarm is the nature of the threat that humanity faces. Essentially, the entire planet is placed at the center of a struggle between microscopic robots, which are obviously named Nanos, since they don’t have a name for themselves, and gigantic robots, which are immediately dubbed Macros. It doesn’t take long before the action of the novel descends into the most visceral, mindless sort of fights that we have seen before in countless robots versus humans films. I won’t deny that all of that is fun to read, but I couldn’t help wondering why the Nanos didn’t just build some big robots to blow up the Macros, or the Macros build some macroscopic robots and start turning everything they touched into grey goo. Or why the Nanos didn’t just infest the Macros and take them apart. Or why the Macros didn’t start strip mining the entire planet from beneath the safety of their shields, instead of fighting humanity in the field. But that’s a debate for another time. It doesn’t matter whether the two strangely, intractably, even inexplicably different robots behave appropriately any more than it matters how an alien can have a silicon-based biology and acid for blood. I suppose we can also overlook, for this book at least, the rapid changes in Kyle’s character, the incredulous, borderline Stockholm Syndrome, relationship between Kyle and his girlfriend Sandra, and the sudden, mildly disappointing ending. What matters is that B. V. Larson uses all of these pieces to tell a fun story. I just hope to see some more character development as the series continues. The audiobook of Swarm is produced by Audible, published on CD by Brilliance Audio, and as a whole meets the usual quality I expect from these companies. Each disc begins and ends with brief musical backgrounds which, while they do little to enhance the story, are not distracting. The last few sentences, about five to fifteen seconds, of each disc are repeated at the beginning of the next disc, which is a feature I always appreciate to draw me back into the story after pausing to change discs. Mark Boyett’s skillful narration perfectly portrays the voice of Kyle Riggs, whether he is calmly describing the procedures for programming an alien computer, or speaking in a panicked, but still clear, tone to convey the terror of facing an alien machine on the battlefield.